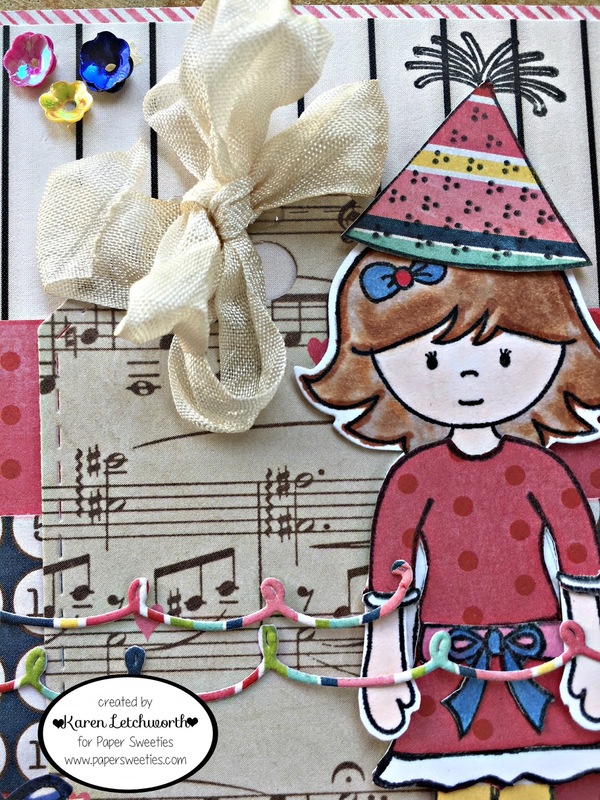 My Cup Runneth Over: Paper Sweeties is Turning 6!! 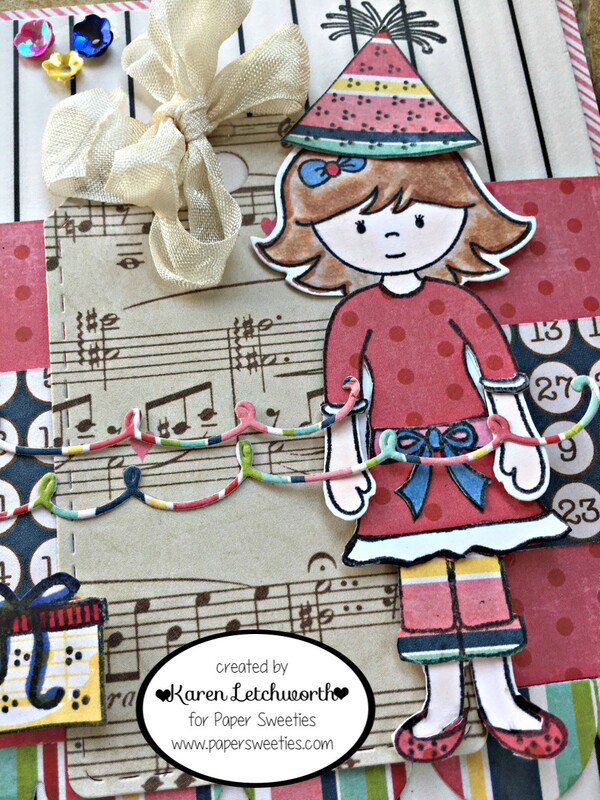 Paper Sweeties is Turning 6!! Welcome by! I'm SO glad you're here to help me and all my friends at Paper Sweeties CELEBRATE 6 years of paper sweetness. If you're not yet familiar with Paper Sweeties, this is a GREAT time to stop by and get acquainted with all the DARLING paper-doll "Sweeties" (Abigail, Emma, Jake and friends), all their adorable outfits, stamp sets and coordinating dies (sweet cuts), delicious seam binding, cupped sequins, and SO much more. And if you're already a fan of Paper Sweeties, we welcome you just the same; and we invite you all to stop by the Paper Sweeties Blog for all the excitement as we celebrate 6 fabulous years of bringing adorable paper sweetness to the crafting community. There's a special challenge, prizes, a $100 Gift Certificate up for grabs, lots of fabulous inspiration, and SO much more. 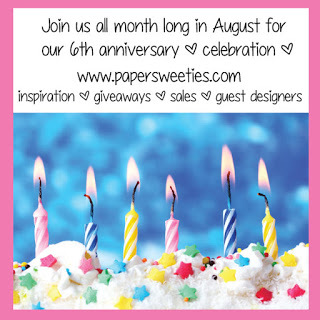 So be sure to stop by Paper Sweeties to see what's happening and join the celebration. I created this little card using some bright patterned papers from Echo Park. Abigail is a real party girl. She NEVER misses an opportunity to dress up and go to a party. And, of course, she would never miss out on celebrating with Paper Sweeties on their 6th Birthday. Abigail was stamped, colored with Copics, and then cut out using the coordinating Abigail Sweet Cut. 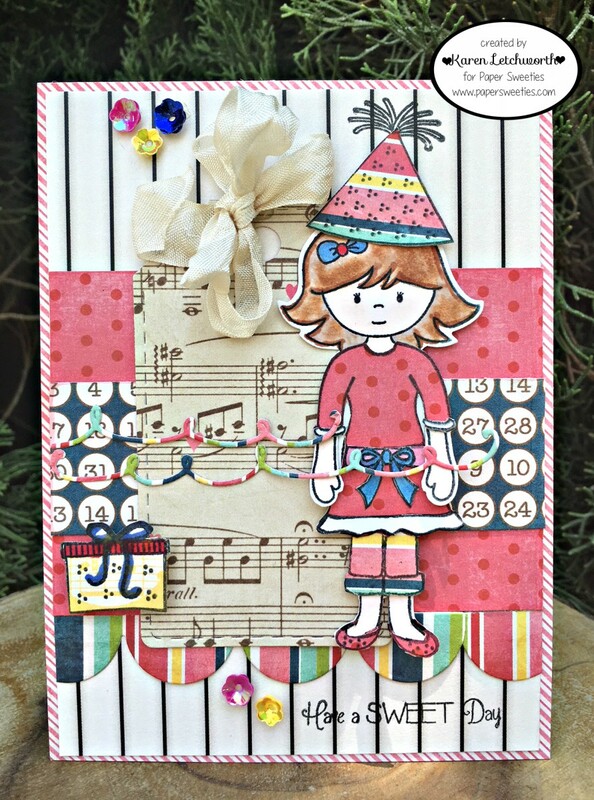 Her adorable little outfit, shoes, hat and gift are from the Wishing You Stamp Set. The tag beneath her was cut using the tag from the For You Sweet Cuts and is topped with a bow of Oatmeal Seam Binding. You'll also see that I cut three borders from my colorful patterned paper (scalloped and swirly) using the Sweet Borders Sweet Cuts. And to add an extra little splash of celebration, I added some Blueberry Sequins as well as Pink Grapefruit Sequins, and Cookie Dough Sequins. 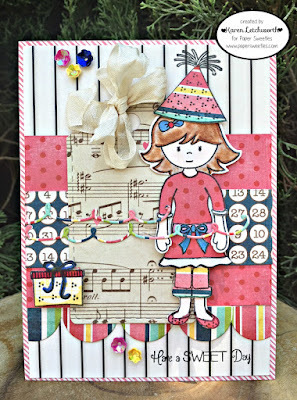 The sentiment, stamped at the bottom right of the card, is from the adorable Sweetie Pie Stamp Set. It's stamped with Coal Ink from ColorBox. One of the (many) things I absolutely ADORE about Paper Sweeties is how perfectly all their stamps, dies, and products work together and compliment one another so well. You will never be disappointed with anything you buy from this store....it's all just SO adorable. I really do invite you to stop by the Paper Sweeties Blog and join the fun. Abigail is so sweet, Karen, dressed in her party best! Thanks for sharing your time and talent with everyone for our birthday celebration! !